Measure around the fullest part of the chest, ensure the tape is under the arms and arms are straight. Measure your waist at your narrowest part (natural waistline). Measure around the fullest part of your hips - standing with feet together. With elbow bent slightly, measure from center of spine at base of neck, across the shoulder and down arm to elbow, finishing at wrist. Measured from crotch to ground (shoes off). Please note: 12 US sizes cover the same range as 16 Euro sizes. For mountaineering: Up size 1/2 a size depending on desired fit. Find your Iliac crest. That's the highest point of the top of you hip bone at tde side. Make sure you are not taking the front of your hip bone. Work out the difference between the two heights in cm. 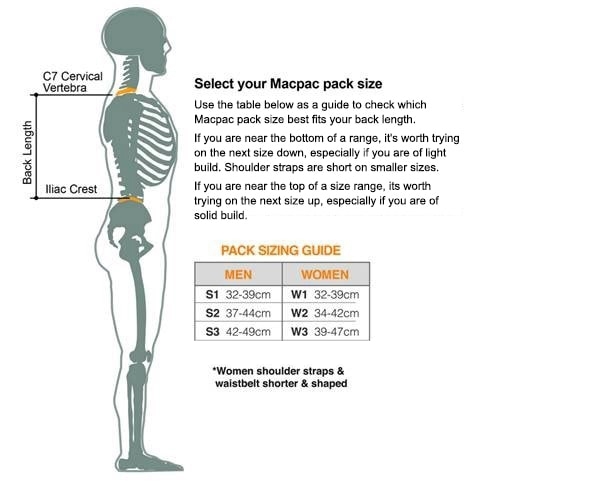 This is your Macpac back length. It is typically between 32 and 44cm for women, and between 37 and 49cm for men.